A team of researchers at Université Côte d'Azur and Hokkaido University have recently carried out a study exploring the spontaneous formation of spiral patterns observed on the downward-facing free surface of a horizontal liquid film. The surface examined by them entails Rayleigh-Taylor instability, which destabilizes the interface between two fluids of different densities when the heavier fluid is pushing down the lighter one. The researchers observed that the liquid discharge resulting from this instability can occur in the form of propagating liquid curtains, which are generated at the film's circular periphery and appear as inwardly rotating spiral arms. Using a phenomenologically constructed cellular automaton, they demonstrated that these patterns arise from the phase locking, which leads to an intermittent discharge of liquid at a constant flow rate over the entire film surface. "About 15 years ago, Dr. Laurent Limat and his colleagues studied spatio-temporal dynamics of liquid columns moving freely along the edge of a circular dish," Christian Mathis, one of the researchers who carried out the present study, told Phys.org. "Inspired by their work, we began the study of a bi-dimensional assembly of liquid columns, hoping to describe all the secondary instabilities related to losses of symmetry. We just found one such instability, but we discovered that we were in front of a rather simple system showing extremely rich behavior." In their study, Mathis and his colleagues observed that increasing the flow rate gave rise to a series of complex patterns, including a regular hexagonal lattice of drops, a regular hexagonal lattice of columns, spatio-temporally intermittent behavior of columns and, finally, liquid curtains forming spiral waves. The apparatus they used is fairly simple, consisting primarily of a semi-closed cylindrical vessel, with silicone oil continuously pouring into it through an inlet at the top and a fine mesh grid at the bottom. The vessel contains a constant amount of oil, determined by the equilibrium of a negative pressure in the vessel and the weight of the oil. Excessive liquid in the vessel leaks through the grid and forms a liquid film underneath it. This film destabilizes in different ways, depending on the oil flow-rate and viscosity. Inside this apparatus, everything is made of transparent PMMA, as this enables easy observation and precise video measurements with adapted lightning. "At a sufficiently high flow-rate, liquid curtains appear, move like waves and, end up coiling around some center point and forming rotating spiral arms," Mathis explained. "We measured the frequency of rotation of each arm and of the whole pattern and the length of arms. The key observation is the spontaneous formation of spirals through breaking the rotational symmetry of the system." Spiral patterns can be found in many systems, both in lab experiments and in nature. Most of these spirals patterns rotate, with the spiral arms trailing the direction of this rotation. Patterns that rotate in the opposite direction are quite rare and are referred to as antispirals. "We have shown that antispiral patterns can be produced in a simple liquid system, for which we know all the governing equations," Harunori Yoshikawa, another researcher who carried out the study, told Phys.org. "Deep investigation of this 'well-known' system would provide insights into rare occurrences of antispiral patterns." The experiment carried out by Yoshikawa, Mathis and their colleagues could pave the way for further studies exploring the manifestation of antispiral patterns. In addition, their study could provide a benchmark for theories of pattern formation. "We are now focusing on theoretical modeling, seeking an appropriate model equation and the ranges of involved parameters," Yoshikawa said. "We hope that we will theoretically reveal the essential features of these pattern formation processes." 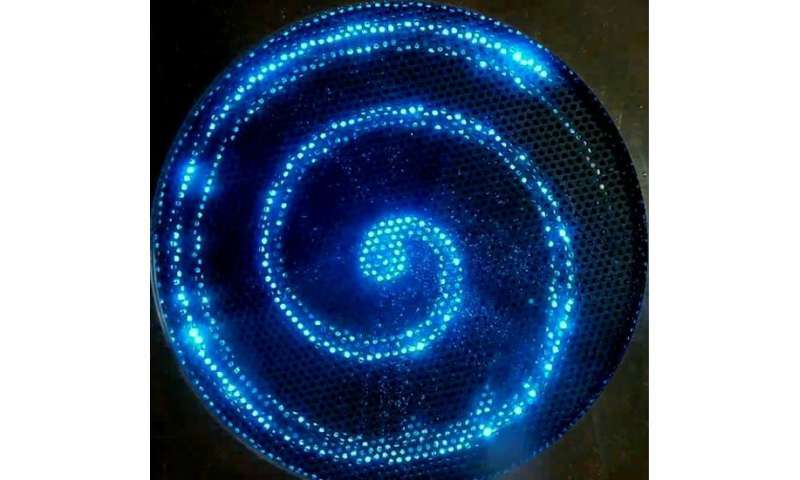 The researchers are also currently exploring other patterns observed in their system, as the inwardly rotating spirals were merely one of their observations. For instance, the dripping regime and some of the peculiar behavior of the liquid columns are yet to be extensively investigated. 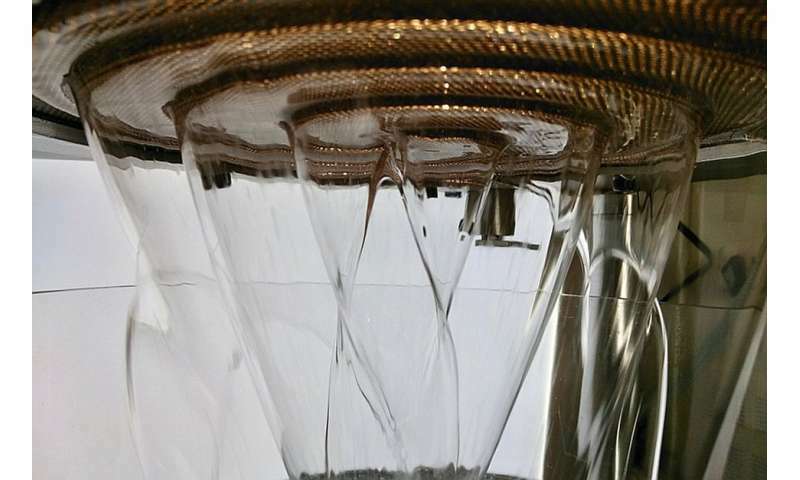 In the study carried out by Mathis, Yoshikawa and their colleagues, the dynamic of the spirals appeared to be related to the characteristics of the liquid film itself, a finding that they are also looking to explore further. Although it is a wild leap, is there any mathematical analogy to gas cloud motions & arm formation in a spiral galaxy ?? nik, are you asking about irrational numbers such as Pi or the Golden Mean? As mathematical examples of a reality where chaos results in orderly patterns. Or the self-disruption when orderly systems compulsively creates turbulence. Or the unpredictability of radioactive decay of an isotope. Or stochastic results from patterned processes? Just because a spiral galaxy looks pretty to our monkey brains? Well buddy, our brains will insist on seeing pattern's even during "The Drunkard's Walk". But they are not valid without conjuring faerie dust, so the real answer is no. There are models of plasma that do so, no faerie dust of physics defying magic tricks required. You're like a cancer on this forum. @R, I'm well aware of those issues, hence my 'wild leap' caution. I'm also aware that certain mathematical and geometric relationships pop up across a vast range of scales. Chemical spirals and chemical gardens may bear a passing resemblance to galaxies, despite one being waves of eg redox reactions, and the other of star formation, main-sequence evolution and death. This film is about a town possessed by malevolent spirals. Sort of like how PhysOrg comment threads become possessed by paranoiacs and crackpots, only more entertaining. "Understanding the mechanism of antispiral formation could offer novel insights into self-organization processes occurring in nature, including the antispiral patterns that have been observed in some galaxies." nik, thanks for your reply comment, made me laugh outloud! ah, phyllis, i prefer to consider myself as a wickedly amusing paranoid crackpot! but that's enough about me... let's talk about how wonderfilled I am! @rrwillisj If you like bizarre films of the Japanese persuasion (as I do) then you should really check out Uzumaki. It's not so much scary as just so damn weird. FYI- I'm on a quest to find common-ground with people I often disagree with in these fora. Some are irredeemable but others, I have hopes for. I'm just so tired of all the invective and disdain we see in social media. Art theory is swell, right up your alley. Isn't this a science site tho? phyllis, you certainly bring a rational Humanist contribution to these commentaries. & I'm sure there are readers who, like you would appreciate a more genteel forum of discussion. Numerous people have mentioned their loathing of my confrontational styling. However, whenever, I point out that genteel is only possible when it is ruthlessly enforced through dueling? Maybe it's my collection of sharp pointy blades & bang-bangs on the wall make them nervous? Art and Science are BOTH in the business of observation and interpretation. So he mentions fluid mechanic modeling (science + math) but instead you choose to pick the word *art* and make some lame comment on that. You don't know anything about science, but you have the audacity to come to a science-based forum and spew crap about how everyone else is uneducated. All because you found a website about the "electric universe" which is so appealing because it doesn't require any thinking. Or education. You're pathetic, and this is why nobody takes you seriously. Even proper trolling seems to require more than you're capable of. Back to the ignore list you go. cant, it has only been in the last century that you ideologues were able to split the Arts & the Sciences. Art explains why Science matters. Science explains how Art matters. You reactionaries seditious attacks on the arts were the opening battles in your efforts to sabotage the Sciences.